“‘Holothuriae, the ‘mizzen’: they have many names, small galleon, Portuguese man-of-war, sea cucumber’–they have little sails, wide at the bottom, small at the top–listen to this! ‘The mizzen can lower or raise this little sail when it feels the wind and wants to sail. Under water a mass of streamers, four or five feet long, hang down from it; the color is a beautiful blue, through which however something green plays. 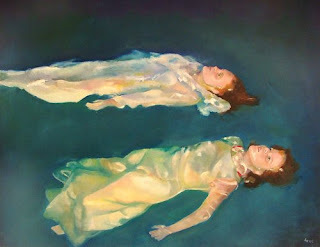 The body is transparent, as if a crystal bottle had been filled with blue-green aqua fortis. The Man-of-War (also known as a bluebottle) is not one creature, as it is commonly assumed, but a complete colony of numerous polyps…each performing their own functions. There are polyps which do nothing but digest the captured food and distribute nutrients to polyps which are not capable of digestion on their own. There are polyps which produce the Medusa, a disc shaped organism which produces eggs and sperm. This organism breaks away from the main Portuguese Man-of-War and floats off to produce many more polyps which, in turn, gather together to form another complete creature. 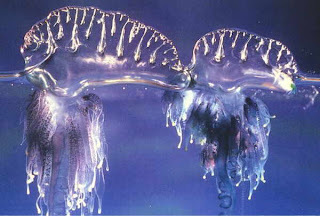 There could be hundreds of polyps which make up the creature we know as the Portuguese Man-of-War. So the Portuguese man-of-war is large, it contains multitudes. Also, those streamers are poisonous so avoid. Heard this story on NPR this morning about crows. It talks about how humans have not evolved brains that would allow us to distinguish one crow from another. Even crow researchers who have studied them many years cannot tell them apart. They have a test on the site which you can take to see if you can tell one from another. 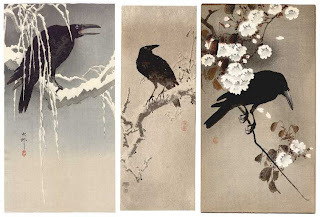 Crows, on the other hand, have a special ability to tell one human from another, and it is based on facial recognition. The scientists say that crows have traditionally had to tell humans apart because some humans were mean to crows and would shoot them while others were nice and would feed them, so it became a survival skill. Yesterday I learned some things about Joan of Arc after watching La passion de Jeanne d’Arc (Dreyer) played in the Acapella parking lot with live backing musicians (Hubcap City). Joan was executed when she was just 19. And she was a key military figure (claiming to recieve directions from God). She led several key French victories in the Hundred Years’ War (which lasted 116 years, off and on) and helped Charles V to the throne. The movie itself was amazing, and now that I know the context more, it makes more sense. Most of the dialogue in the movie was taken directly from records of her actual trial and execution. I’m starting a new series of posts, one for every day (until I give up like I do most things)… where I’ll post one thing I learned on that day. Hopefully I’ll have learned at least one thing a day, though I reserve the right to not learn anything.